MEMPHIS, TN--(Marketwire - May 13, 2008) - Prostate cancer, when caught early, is highly treatable and studies show the most effective treatment for prostate cancer is surgery. To help educate patients about the most innovative surgical option available, Methodist Le Bonheur Healthcare will present a live surgical webcast featuring a robotic prostatectomy surgery, a minimally invasive treatment for prostate cancer, Tuesday, May 13, at 2 PM on www.OR-Live.com. 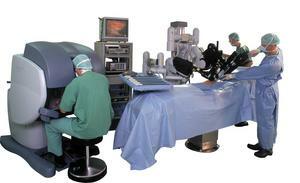 The da Vinci Surgical System at Methodist North Hospital is the most advanced robotic surgical system available. It incorporates the latest advancements in robotic-assisted technology and provides surgeons with greater visualization, enhanced dexterity, precision, control and superior ergonomics. The live prostatectomy surgery will be performed in the Robotic Surgery Center at Methodist North Hospital. Methodist North Hospital is part of a seven hospital system within Methodist Le Bonheur Healthcare. "Robotic surgery has really revolutionized prostatectomy," said Richard Pearson, M.D., a urologist and surgeon with The Conrad/Pearson Clinic.